This 260 sqft external self storage unit offers fantastic 24/7 access on the HD CCTV monitored Lower Healey Business Park in Chorley. 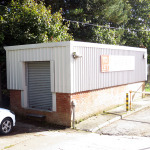 The unit comes complete with optional full length and height racking allowing the tenant to make full use of the 260sqft of space on offer. Ideally suited for traders, tradesmen, distributers and micro business operators. Available at just £70 p/w + VAT with discounts available for long term users.